Update 29 March: It was delayed a few times but this is final! 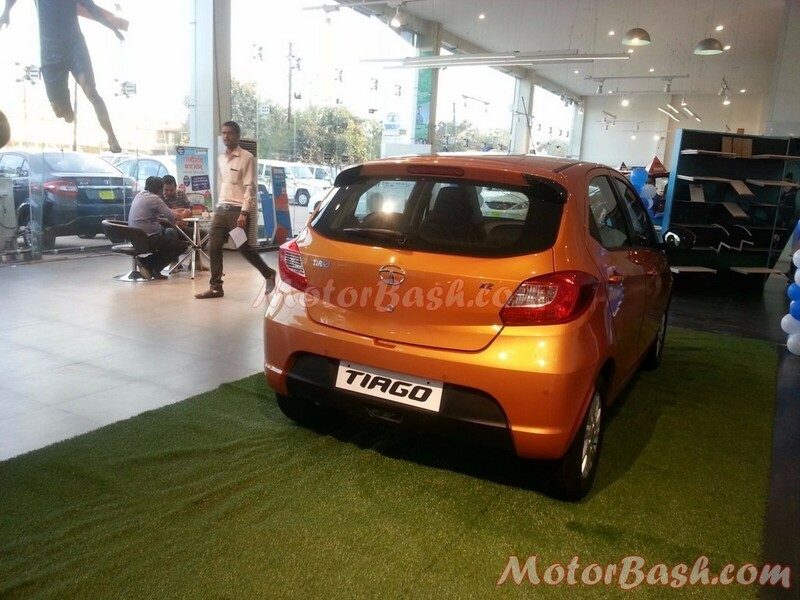 Tata has rolled out invitations for the commercial launch of Tiago which is scheduled on 6th of April in Mumbai. Update 14 March: Tata has officially announced the commencement of bookings of Tata Tiago from March 10 onwards at a payment of Rs 10,000. You can either book the small hatchback online at its official website or at any dealership (provided you are 18 years or over). 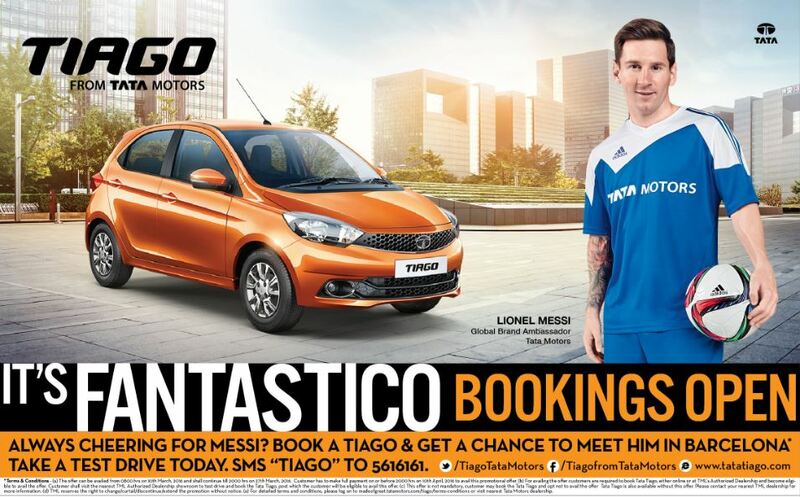 Further, Tata is also providing an opportunity to the buyers of Tiago to meet Lionel Messi in Barcelona. 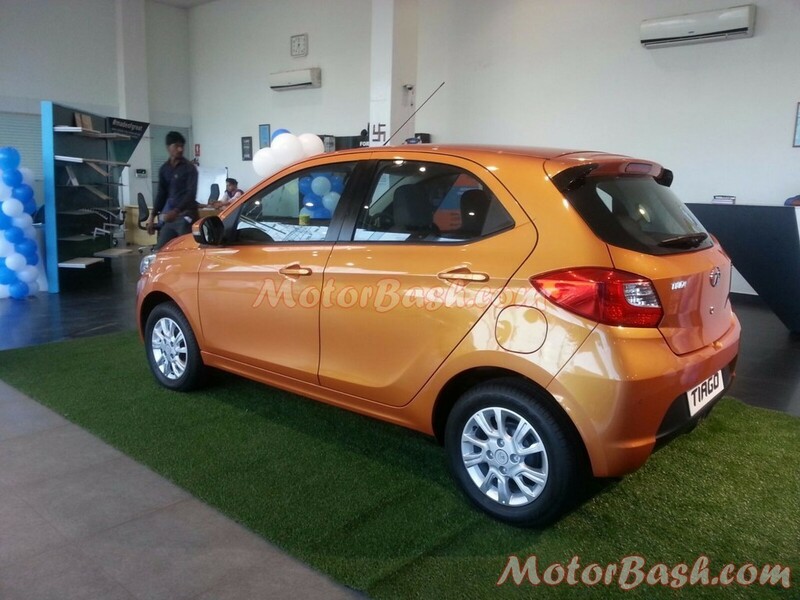 Update 7th March: Autocar reports that Tata has scheduled 28th March as the official launch date of Tiago (rebranded Zica) in India. 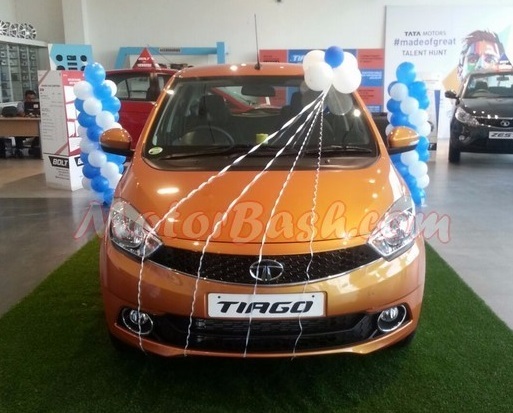 Earlier, Tata has already communicated that they are planning for an end-March launch of Tiago. However, we haven’t received any official invite yet! Original article continues..
Tata has started dispatching the Zica/Tiago to dealerships across the country. This car was spotted at a dealership in Bhopal. The car is kept on display and available for test drives for prospective customers. Tiago is the replacement name for the Zica after the Pune based manufacturer decided to re-brand it due to its similarity with a virus spreading terror in the West. Actually, the car you see in pics arrived at the dealership before the Auto Expo, when it was still Zica. There were two samples that were received – most probably the diesel and the petrol variants. However, these are display cars and not for sale. The dealership informed us that the sale-ready Tiago consignment will reach them within the next few days and will be badged ‘TIAGO’ from the company itself. Tiago will be powered by two all-new engines – the petrol mill displaces 1.2 litre and has a three cylinder layout and the diesel is a 1.05 litre mill with a similar layout. Mated to these will be a 5 speed manual gearbox. An AMT unit might be offered too at some point in the future, although there has been no confirmation on the same. The car marks a new era for Tata as they move ahead of their dependence on Fiat’s 1.3 litre Multijet diesel engine. This will not just save costs but will also give them valuable experience. 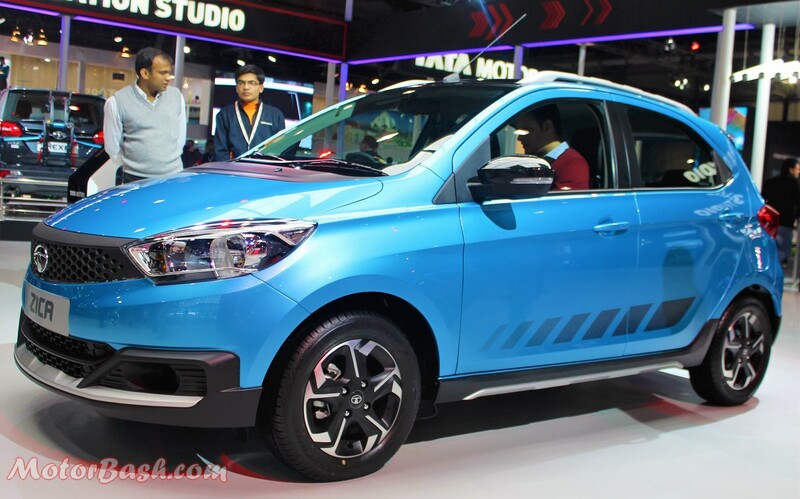 We expect Tata to price the WagonR and Eon competitor between Rs 2.99 lakhs to Rs 4.5 lakhs and they have already announced that official commencement of sales is expected from March-end. Also post launch, do not be surprised if they discontinue the ancient Indica which has been doing duty for a long time now. © All content copyright MotorBash.com.